An Alabama loss to Ole Miss could hurt the SEC's College Football Playoff hopes. Roundtable: Which team has been the most disappointing through Week 2? Of course the Crimson Tide haven’t erased last year’s 23–17 loss to Ole Miss from their memories. Of course it still stings to remember Rebels fans storming the field and ripping down the goalposts at Vaught-Hemingway Stadium last October, a celebration that followed Alabama’s only regular-season defeat of 2014. But what truly digs at the Crimson Tide is this: The better team might not have won last year’s game. Ole Miss ended 2014 by losing four of its last six games, while Alabama rebounded to win the SEC title and reach the College Football Playoff. On Saturday No. 2 Alabama will welcome No. 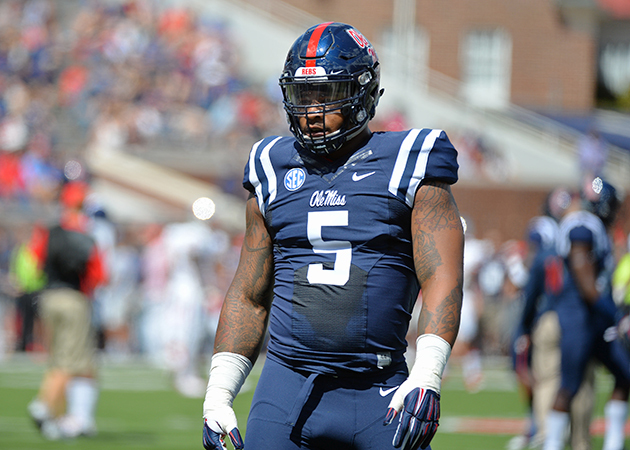 11 Ole Miss to Bryant-Denny Stadium in hopes of avenging last season’s upset. But only three weeks into the season, the Crimson Tide might also carry the weight of the entire SEC on their shoulders. That’s because the conference that touts itself as the toughest league in America has looked very vulnerable through two weeks of football. A home loss by Alabama—even to a conference foe—would serve as the latest chink in the league’s armor. The SEC went a piping-hot 12–1 in Week 1, with Vanderbilt’s 14–12 loss to Western Kentucky serving as the only loss. (LSU’s opener against McNeese State was cancelled due to weather.) As a result, a record 10 SEC teams landed in the next week’s AP poll. But Week 2 wasn’t as friendly to the conference. Preseason SEC favorite Auburn needed overtime to beat Jacksonville State, an FCS opponent. Arkansas lost to Toledo, and Tennessee blew a 17–0 home lead in a loss to Oklahoma. Meanwhile, Florida and Missouri survived one-score games with East Carolina and Arkansas State, respectively, two programs from Group of Five leagues. Alabama has been one of the few constants in the SEC this season. It opened with a sharp 35–17 win over Wisconsin in Week 1. Last Saturday the Crimson Tide sunk Middle Tennessee 37–10, but they started slowly against the Blue Raiders, holding a 7–3 lead until midway through the second quarter. Quarterbacks Jake Coker and Cooper Bateman combined for two interceptions, and Saban said Middle Tennessee could have easily forced more turnovers. This week Saban pointed out his team’s lack of execution. “We’re a little inconsistent in the way we played on both sides of the ball,” Saban said. If the season’s first two weeks are any indication, Ole Miss will be the biggest test thus far for the Alabama defense. The Rebels trampled Tennessee-Martin and Fresno State by a combined score of 149–21, becoming the first SEC team to score 73 or more points in back-to-back games. Transfer quarterback Chad Kelly has taken advantage of the schedule’s cupcakes to emerge as the FBS leader in pass efficiency (234.0) and yards per attempt (13.9). Meanwhile, Laquon Treadwell, Cody Core and Quincy Adeboyejo have formed a strong pass-catching trio alongside talented tight end Evan Engram. Last year against Alabama, the Rebels scored the game’s final 13 points, with quarterback Bo Wallace throwing three touchdown passes in the second half. Wallace completed 18 of his 31 passes against a Tide secondary that Saban contends is improved from a year ago. But it’s also possible Ole Miss won’t face a better defensive front this season; Kelly must evade Tide defensive tackle A’Shawn Robinson and the rest of a stellar front seven in only his third start at quarterback. But fans hoping the SEC will assert itself as the nation’s best conference might fear an Ole Miss victory in Tuscaloosa. Alabama and Auburn entered the year as presumed playoff contenders. After the Tigers showed warts against an FCS team last week, a poor outing by the Crimson Tide on Saturday would mean the SEC’s most dangerous squads look beatable after the season’s first month. Of course, Ole Miss could always turn an Alabama upset into its own playoff run, but that didn’t happen last year. Recent history suggests it’s far too early to bury a conference. Big Ten fans remember Ohio State’s loss to Virginia Tech last September being painted as a stake in the league’s eventual playoff hopes. All the Buckeyes did was go on to win the national championship. That’s why Saban and Alabama don’t feel pressure to carry water for the SEC on Saturday. “If you’re a great competitor, you want to play in games like this,” Saban said. But we’ll soon find out just how many true competitors remain in the SEC.